Club Dumbbell Grips™ were invented by IRONWEAR™ over a decade ago as a simple way to add comfort and improve the handling of steel dumbbells. The new model, Club Dumbbell Grips™ surpasses all previous designs by providing superior feel and performance. Club Dumbbell Grips™ are a great gift especially in winter for anyone who lifts weights. No one looks forward to holding the cold steel dumbbell weight handles. Get yourself or that special person Club Dumbbell Grips™ to protect the hands and make lifting more fun and safe. Club Dumbbell Grips™ include a special leather-soft surface for a nice feel in the hand, a reinforcement layer for strength, a padded layer for comfort, and an aggressive adhesive layer to help keep the Club Dumbbell Grips™ from shifting or twisting. Club Dumbbell Grips™ special leather-soft surface provides the feel of glove leather, does not absorb moisture, and is durable and easy to clean. The leather-soft surface is the same as used in IRONWEAR’s Club Line and feels comfortable against the skin, the texture reduces the likelihood of slippage between the dumbbell and the hand without feeling tacky. The Club Dumbbell Grips™ surface is nonporous and moisture does not soak into the grip so that sweat is not absorbed into the grips. By blocking moisture and sweat the dumbbells absorb less odor. The moisture remains on the surface for easy cleaning. The Club Dumbbell Grips™ are easily wiped clean and disinfected. Club Dumbbell Grips™ leather-soft surface is bonded to the reinforcement fabric and the rubber padding. The multilayer system keeps the Club Dumbbell Grips™ in place and protects the rubber padding from abrasion rips and tears. The reinforcement fabric keeps the grips from distorting from the forces exerted by the hand and the dumbbell. Club Dumbbell Grips™ neoprene rubber padding is approximately 1/8 inch thick and contours to the shape of the fingers to provide a more comfortable and secure grip on the weight. The rubber padding protects the hand from the rough metal surface and insulates the hand from the temperature and the heat absorbsion of the steel. Without gloves the user has better sense of the position of the weights and a more control of its movements. The rubber padding makes using steel dumbbells without lifting gloves much more comfortable. Club Dumbbell Grips™ include an aggressive layer that bonds the rubber padding along the whole surface of the steel dumbbell handle. The aggressive bond prevents the Club Dumbbell Grips™ from sliding, twisting, or shifting. Using dumbbells exerts torque exerted between the hand and the dumbbell and the aggressive bond maintains the position of the Club Dumbbell Grips™. 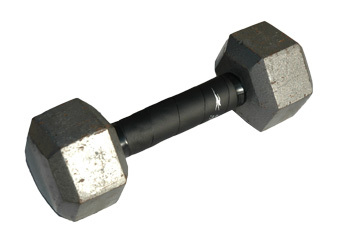 Club Dumbbell Grips™ improve the look and performance of any new or old dumbbells. Club Dumbbell Grips™ upgrade less expensive dumbbells and make them more comfortable and provides a safer gripping surface. 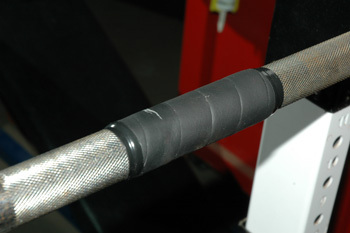 Club Dumbbell Grips™ can be used on lifting bars to provide padding and insulation. Just measure and position the Club Dumbbell Grips™ precisely where the hands are to be positioned to insure correct hand placement day after day. Club Dumbbell Grips™ spiral wrap around the handle or bar quickly and can be cut easily with scissors to a desired length. 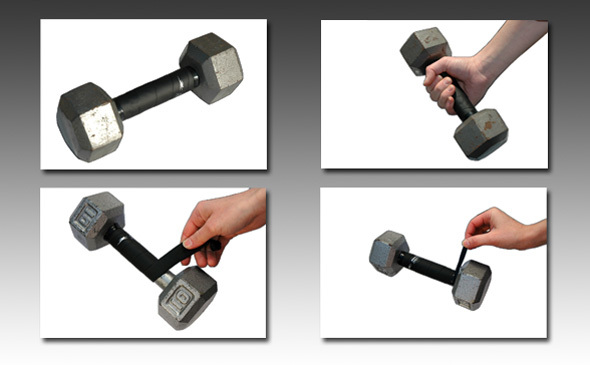 Club Dumbbell Grips™ are approximately 5 inches long when wrapped around most standard bars or handles. 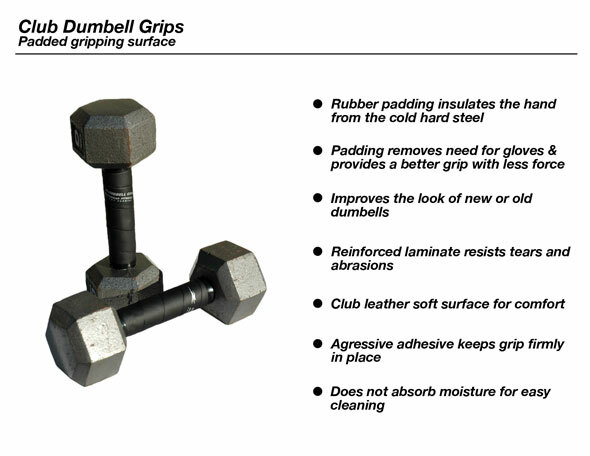 Club Dumbbell Grips™ have a 1 year replacement warranty.